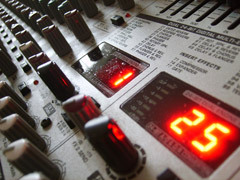 Chicago and Northwest Indiana DJs are now offering affordable uplighting packages that can be added to any dj service. Chicagoland DJ Services is your one stop shop for quality wedding reception entertainment as well as uplighting services. Uplighting is one of the the biggest trends in wedding reception decorating today, and our customers appreciate our low prices on uplighting compared to our competition and the overpriced venue uplighting charges. So what exactly is uplighting? Quite simply, it’s a series of lights, set up around a room, placed on or near the floor, shining up toward the ceiling. The light beams created on the walls gives the room a look of colored pillars accenting and complimenting the entire room. You can pick any color (s) that best set the mood and match the colors of your event. 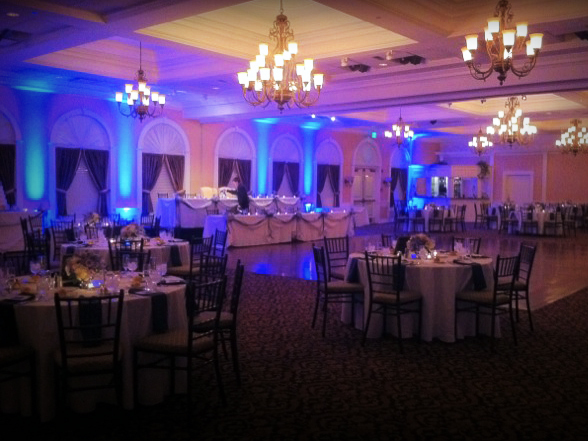 Uplighting can create the perfect feel and add a dramatic impact to your wedding reception. 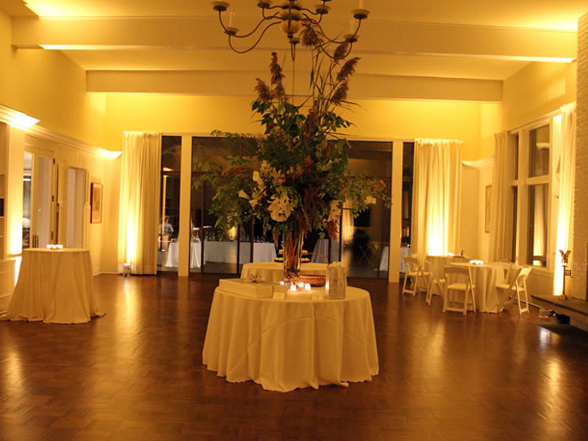 When used properly, uplighting can greatly enhance the ambiance of the room in a very elegant way. Make your wedding reception the most personalized and visually beautiful, stunning event possible with our professional uplighting packages. Is uplighting right for my event? See for yourself. Chicagoland DJ Services offers two affordable uplighting packages to take the hassle and costly expense of obtaining uplighting from a separate source or through the venue itself. 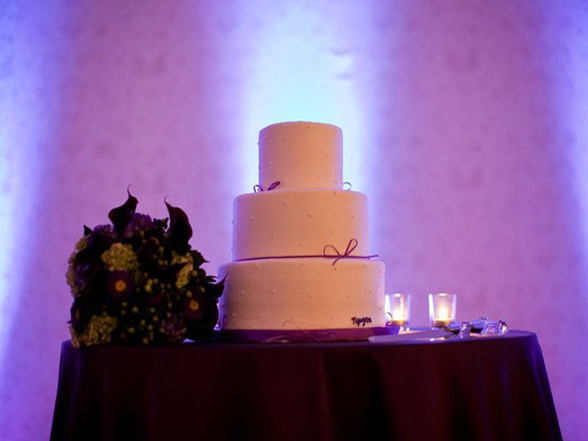 And uplighting isn’t just for wedding receptions. 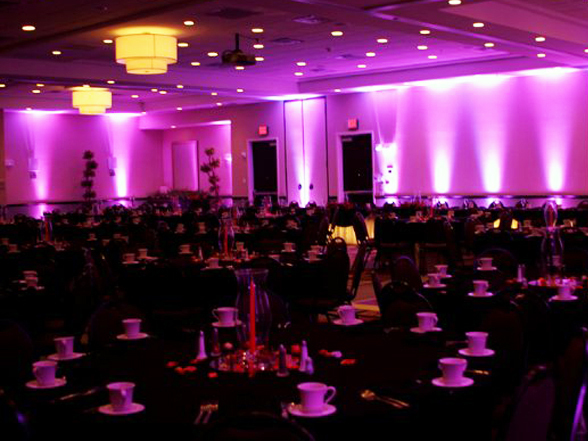 Uplighting is recommended for any event where making a visual impact is important to the client. 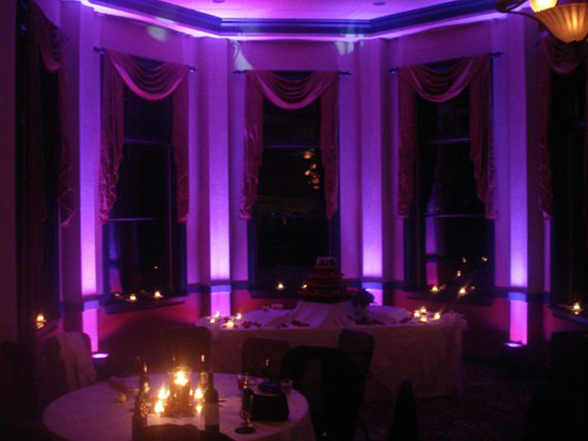 Our 8 light uplighting service is now only $200 when added to any event. Our most popular 12 uplight service is only $300 when added to any event. Call or contact Chicagoland DJ Services for more information and availability for your event.